The family of UPTON was seated at Upton, Cornwall, about the time of the Conquest. ARTHUR UPTON, of Lupton, Devon, elder brother of the Chevalier John Upton, Knight of Malta, and grandson of John Upton, of Lupton, by Joan his wife, daughter and heir of Sir Wincomb Raleigh, Knight. John Upton, of Lupton, was fourth in descent from John Upton (and Agnes his wife, sister and heir of John Peniles, of Lupton), younger son of John Upton, of Trelaske, Cornwall. HENRY UPTON (1592-1642), fixed his abode in County Antrim, and was returned to parliament for the town of Carrickfergus in 1634. CLOTWORTHY UPTON (1660-1725), of Castle Upton, MP for Newtownards, 1695-1703, Antrim County, 1703-16, who, raising a party of men, joined the standard of WILLIAM III at the siege of Limerick, and was taken prisoner there, after entering the breach sword in hand, and almost alone, his followers, nearly to a man, being cut to pieces. 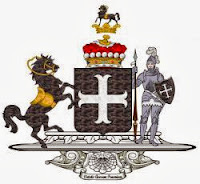 issue; and secondly, Margaret, daughter of William Stewart, of Killymoon, County Tyrone, who died also without issue; and thirdly, Jane, daughter of John Ormsby, of Athlacca (by whom he had an only daughter, ELZABETH, who wedded the Rt Hon Hercules Landford Rowley, and was created a peeress of the realm, as Baroness Langford). JOHN UPTON, of Castle Upton, MP for County Antrim, a military officer, who distinguished himself at the storming of the citadel of Liège, and at the battle of Almansa, under Lord Galway; where, for his spirited conduct, he obtained the command of a regiment, upon the fall of Colonel Killigrew. Colonel Upton wedded, in 1711, Mary, only daughter of Dr Francis Upton, of London, by whom he had three sons and five daughters. Elizabeth Albinia, m 1st Marquess of Bristol. Mr Upton was elevated to the peerage, in 1776, by the title of Baron Templetown, of Templetown, County Antrim. His lordship was created a viscount, in 1806, as VISCOUNT TEMPLETOWN, of County Antrim. Henry Augustus George Mountjoy Heneage Upton, 5th Viscount (1894–1981). His lordship wedded secondly, in 1975, Margaret Violet Louisa, widow of Sir Lionel George Arthur Cust.On the decease of the 5th Viscount the titles expired. The ancestral seat of the Templetown family was Castle Upton, Templepatrick, County Antrim. CASTLE UPTON demesne, beside Templepatrick, County Antrim, is near the half-way point on the main road from Antrim to Belfast. The demesne lies on the north side of the village; and the house contains numerous features which are of historical and architectural import. The Anglo-Norman style flanker towers now form part of the main house of 1612; which, in turn, occupies the site of a 13th century priory of the Knights of St John (Hospitallers) - monks who joined the Last Crusade, sailing from Carrickfergus in County Antrim. The said monks were expelled from Templepatrick during the Reformation; and the Knights' vaulted refectory was reconstructed, when the mansion was extended by Robert Adam in 1783 for the 1st Viscount Templetown. Castle Upton House today is essentially a plantation castle built at the end of the 16th and beginning of the 17th centuries by Sir Robert and Sir Henry Norton Bt, who named it Castle Norton. The castle was sold in 1625 to Captain Henry Upton, who promptly re-named it Castle Upton. From 1783 Clotworthy Upton, 1st Baron Templetown, and his son (later 1st Viscount Templetown) employed Robert Adam to modernize the interior and give the exterior a "castle air". Adam raised and machiolated the pair of round towers from the original castle and gave them high, conical roofs, adding a wing with another tower. Adam also designed a Classical mausoleum in the church-yard and a splendid castellated stable range, in 1789. In 1837 Edward Blore was employed by the 2nd Viscount to re-model the Castle, inserting mullioned windows and eradicating most of Adams' interiors; raising and panelling the hall; and refurbishing the main reception rooms in a restrained Elizabethan style, with fretted ceilings. 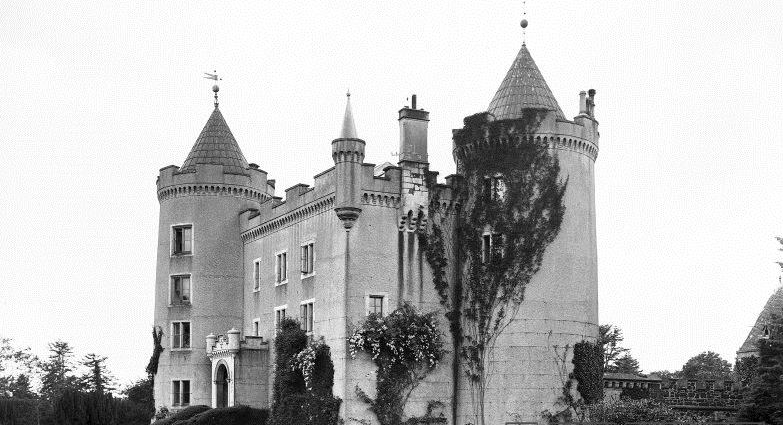 The Castle was sold by the Upton family early in the 20th century; and the subsequent owner re-roofed the main building, an act which ruined Adam's romantic skyline. Adam's additional wing was allowed to fall into ruin. In 1963, the 300-acre estate was purchased by Sir Robin Kinahan who, with Lady Kinahan, restored the Castle most sympathetically. Their most notable achievement was the rebuilding of the ruined Adam wing, which now contains an elegant ballroom; and an Italian marble chimney-piece formerly at Downhill Castle in County Londonderry. The demesne itself is now diminished, with trees near the house, a small artificial lake and lawns where a 19th century formal garden was once laid out. The walled garden is used as a field. Robert Adam’s stable block is approached via a contemporary gate lodge of 1820. The impressive village entrance to the house is by Edward Blore (1837) and has a gate lodge hidden behind it. 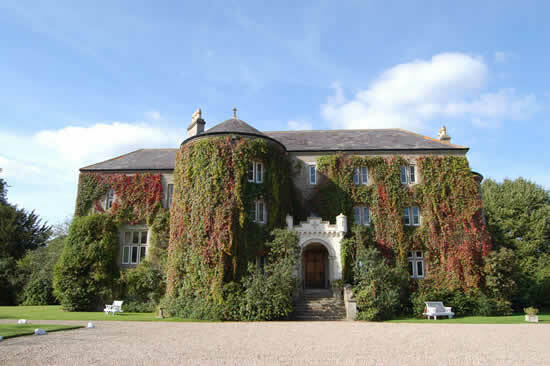 Today the demesne is home to Sir Robin and Lady Kinahan's son, Danny Kinahan DL MP, and his family, though it is currently (April, 2016) for sale. I have met the late Sir Robin several times: When he was Lord-Lieutenant of Belfast at ceremonies in the Ulster Hall; and as chairman of the board of Belfast Cathedral. I recall him well. A true gentleman indeed. First published in March, 2010. Templetown arms courtesy of European Heraldry. The Castle looks much the worse for having lost its embellishments. It appears to have been 'Prebyterian-ised'. Also the demesne has been chopped up and sold off over the years. Much of the park is golf course or housing developments. Very sad state of affairs. Templeton Mausoleum is a Grade A listed building located in a small graveyard in Templepatrick, County Antrim. It was built and designed in 1798 by Robert Adam in the Neo-classical style. The mauseleum is important for its architectural rarity but also for the great beauty of its design. It was built in the shape of a triumphal arch and is decorated in classical urns, leafy swags and circular reliefs. My great grandpa bought the property in the 1920s. Thereafter my grandpa, a very successful businessman, took over the property in the 1940s. During this tenure, the property was utilized as a progressive farm. Thanks for the posting. Interesting read.